“Hyper-personalization” of email is becoming a reality as data science makes reporting on, and tracking consumer activity, even more precise. Marketers are collecting massive amounts of data that allow automation to streamline email communication and deliver targeted content. More robust Email automation tools are on the way according to Daniel Codella of Zurb. These tools will seamlessly integrate with mobile strategies and allow marketers to capitalize on trends and immediately connect with their target audience. 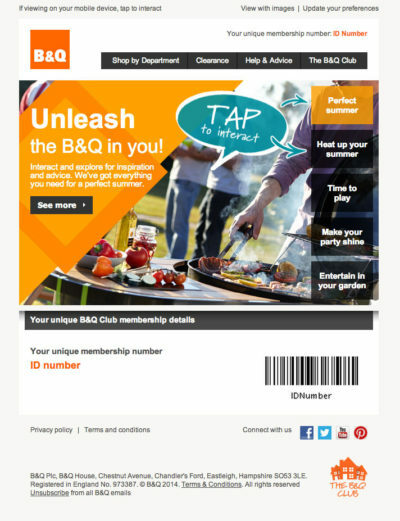 A UK company, B&Q, is poised to produce the next email standard – “Kinetic email”. Each user has a unique member ID and barcode. An interactive carousel changes with each mouseover and displays different items. This would assume that the user base is mostly mobile – since only mobile devices can get in on the action. But who isn’t mobile these days? As always, content will be of paramount importance in this Tsunami of strategic communication.